"It's hard to make slow-cooked food look pretty, and this pork seriously fell apart when I tried to take it out of the slow cooker, so don't judge this by its picture. I promise that this recipe is delicious! My husband even said that this is one of his favorite Sunday dinners. I also made mashed potatoes and the gravy was delicious on them. Use roast between 2 to 3 pounds." Prepare slow cooker crock with cooking spray. Lay pork roast into crock. Whisk Parmesan cheese, honey, soy sauce, basil, garlic, oil, and salt together in a small bowl; pour over the pork roast. Cook until roast is cooked completely through, 6 to 7 hours. An instant-read thermometer inserted into the center should read 160 degrees F (70 degrees C). Remove roast to a cutting board to rest a few minutes. Skim fat from the cooking juices; discard. Ladle remaining juice to a small saucepan; bring to a boil. Whisk cornstarch into cold water in a bowl until dissolved; pour into boiling liquid in saucepan. Cook the liquid, stirring frequently, until thickened into a gravy, about 2 minutes. 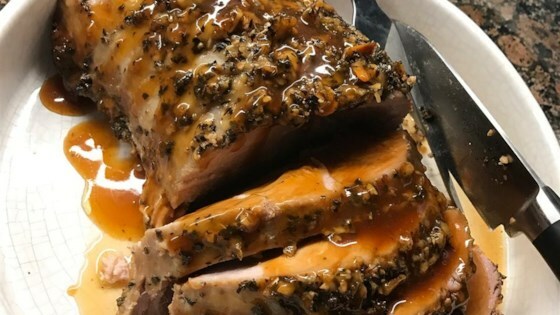 Slice pork roast and serve with the gravy. All you need are 10 minutes to prepare this juicy, tangy roast pork. I cooked a 2.5lb roast on low for 6 hours. That was too long so I will adjust next time. Other than that, the flavors were great! BF loved it!! That's all that matters to me.